"He is irrational, he is unhinged, and I think he has done a lot of damage" to the U.S.-Saudi relationship, Graham said. 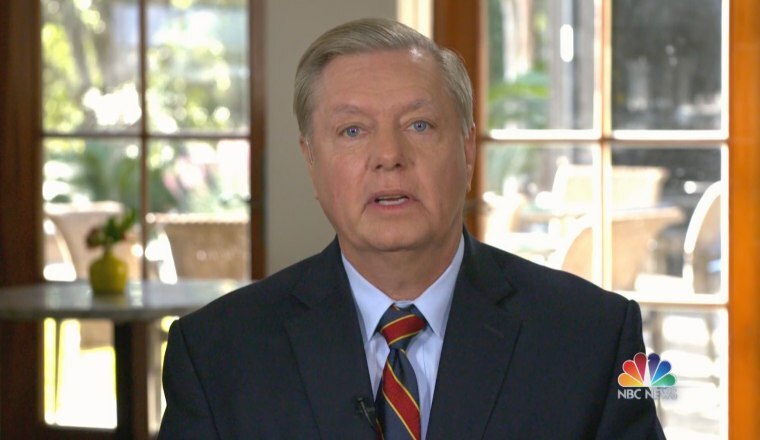 WASHINGTON — Republican Senator Lindsey Graham on Sunday harshly condemned Saudi Crown Prince Mohammed bin Salman over his alleged role in the killing of journalist Jamal Khashoggi, calling him "unhinged" and pointedly refusing to work with the prince in the future. "The fact that he didn’t know about it is impossible for me to believe," Graham said on Sunday's "Meet The Press." The South Carolina senator said he hasn’t been given an official briefing on the matter, but maintained that the conclusion that the crown prince had a role in Khashoggi's murder should be clear to anyone with knowledge about the country. Graham's language on Saudi Arabia stands in stark contrast to President Trump, who repeatedly told "Fox News Sunday" this weekend that the crown prince has continually denied involvement in the incident. "From the legislative branch side, we’re going to do as much as we can, as hard as we can, to send a signal to the world," he continued. "This is not how we expect an ally to act. What happened in Turkey violates every norm of civilized society and it will not stand. And if John McCain were alive today, he’d be the first one saying that." Also on "Meet The Press," Graham publicly called on the president to move forward on the issue of criminal justice reform, asking him to “pick up the phone” and lobby Senate Majority Leader Mitch McConnell to bring their bill on the issue to the floor.